Lawrence E. “Larry” Bray, one of Wisconsin’s top architects who dedicated his life to designing and building over 900, innovative, unique, and award winning buildings all over the Midwest, died peacefully on Wednesday morning, (November 14, 2018). He was 93. Larry founded Bray Associates Architects in 1962, specializing in the design of schools. His first project was designing the schools in his hometown of Valders, WI, where his father was the superintendent for 33 years. Other notable projects in his portfolio include: Sheboygan South High School - working with Stubenrauch, the University of Wisconsin-Sheboygan Campus, Horace Mann Middle School, and St. Dominic’s Catholic Church. After designing nearly one thousand projects in a successful business for 34 years, he turned the company over to his three children; Larry Jr., Patricia and Geoffrey in 1996. Larry was born on July 25, 1925 in Valders, WI son of the late Charles “C.E.”and Mary (Brennan) Bray. 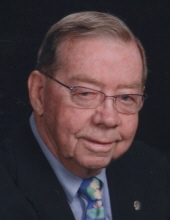 He graduated from Valders High School in 1940 and Ripon College in 1944. He met the love of his life, Lyndoris “Lynn” Lensmire at a dance in Silver Lake shortly before he shipped out and proudly served in the US Navy during World War II in the Pacific, from 1944-1946. Immediately after the war, he married Lynn on June 7, 1948 and the couple resided in Cambridge Massachusetts while Larry received his degree in architecture from MIT. Returning to Wisconsin in 1951 where he spent many years working and raising a family in Sheboygan and Elkhart Lake, WI eventually retiring in 1996. With a passion for storytelling Larry began journaling about his life’s events back in the 1960’s and with more time available after retirement he continued writing including numerous journals about his life. He also completed a book titled “Historic Elkhart Lake” which included many of the 75 watercolor paintings he completed of Elkhart Lake. He was assisted in these endeavors by his good friend Tom Engel. Larry also took several watercolor art classes at Bonita Art Center in Bonita Springs, Florida where he and his wife Lynn spent winters from 1992-2006. Larry was active in the American Institute of Architects (AIA), the Sheboygan Elks and Kiwanis groups, Generations in Plymouth, and charitable to multiple Catholic churches in Sheboygan County. He was also actively involved in the ROMEO (Retired Old Men Eating Out) group in the Elkhart Lake area for many years as well as a regular Monday morning men’s group. His personal time was spent raising his loving family, including 7 children, 8 grandchildren and 7 great grandchildren. Larry cherished the 64 year marriage with his wife Lyndoris (Lynn) and the life they shared. He also loved the many experiences they shared traveling all over the world. Survivors include: Six children: Larry Bray Jr. (Jan) of Landrum, SC, Patricia Balliet (Tim) of Indio, CA, Geoffrey Bray (Jill) of Elkhart Lake, Holly Welsch (Jeffrey) of Elkhart Lake, Lori Bray-Levinsohn (Steve) of Sheboygan, and Janine Bolz (Richard) of Cleveland; Eight grandchildren: Tyler and Spencer (Emily) Balliet, Tony (Jennifer) Bray, Jonathon (Megan Brengarth) Bray, Allie Welsch, Kasey Levinsohn, Felicia (Paul) Holzwart and Marquis Bolz; Seven great grandchildren: Milo, Fletcher, Isabelle, and Rowan Bray, MacKenzie, Kendall and Harper Holzwart. Also survived by nieces, nephews, other relatives and many friends. He was preceded in death by his wife: Lyndoris Bray; son: Gregory Thomas Bray; brothers: Jim (Margie) Bray, Gene (Faye) Bray and Jack (Patricia) Bray; sister: Darlene (John) Osieczanek; daughter-in-law: Diana Bray. Mass of Christian Burial will be held on Tuesday morning (November 20th) at 10:30 A.M. at St. Thomas Aquinas Catholic Church in Elkhart Lake. Father Philip Reifenberg will officiate and burial will be in the Calvary Cemetery in Sheboygan. Relatives and friends may call at the Suchon Funeral Home in Plymouth from 4-7:30 P.M. on Monday evening and at the CHURCH in the Resurrection Chapel at St. Thomas Aquinas Catholic Church on Tuesday morning at 9:30 A.M. from until the time of the services. A memorial fund is being established in Larry’s name for the renovation of the Elkhart Lake School District Auditorium. The family would like to send special thanks to the staff at Cedar Bay Assisted Living and Sharon S. Richardson Community Hospice for all their care and compassion. To send flowers or a remembrance gift to the family of Lawrence "Larry" Bray, please visit our Tribute Store. "Email Address" would like to share the life celebration of Lawrence "Larry" Bray. Click on the "link" to go to share a favorite memory or leave a condolence message for the family.